276 pages | 9 B/W Illus. The past decades have witnessed a surge of sociological interest in the body. From the focal point of aesthetic investment, political regulation and moral anxiety, to a means of redefining traditional conceptions of agency and identity, the body has been cast in a wide variety of sociological roles. However, there is one topic that proves conspicuously absent from this burgeoning literature on the body, namely its role in the everyday (re)production of class-boundaries. Distinctions in the Flesh aims to fill that void by showing that the way individuals perceive, use and manage their bodies is fundamentally intertwined with their social position and trajectory. Drawing on a wide array of survey-data – from food-preferences to sporting-practices and from weight-concern to tastes in clothing – this book shows how bodies not only function as key markers of class-differences, but also help to naturalize and legitimize such differences. Along the way, it scrutinizes popular notions like the ‘obesity epidemic’, questions the role of ‘the media’ in shaping the way people judge their bodies and sheds doubt on sociological narratives that cast the body as a malleable object that is increasingly open to individual control and reflexive management. 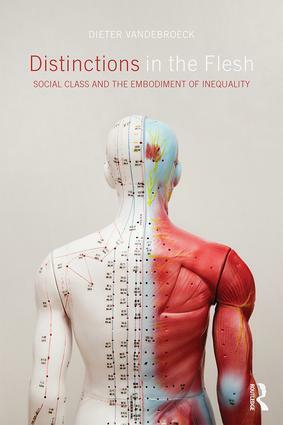 This book will be of interest to scholars of class, lifestyle and identity, but also to social epidemiologists, health professionals and anyone interested in the way that social inequalities become, quite literally, inscribed in the body. Dieter Vandebroeck is an assistant-professor of sociology at the Free University of Brussels (Vrije Universiteit Brussel) and a former visiting fellow at the Centre for Research on Socio-Cultural Change (CRESC) at the University of Manchester. This series establishes the importance of innovative contemporary, comparative and historical work on the relations between social, cultural and economic change. It publishes empirically-based research that is theoretically informed, that critically examines the ways in which social, cultural and economic change is framed and made visible, and that is attentive to perspectives that tend to be ignored or side-lined by grand theorising or epochal accounts of social change. The series addresses the diverse manifestations of contemporary capitalism, and considers the various ways in which the `social', `the cultural' and `the economic' are apprehended as tangible sites of value and practice. It is explicitly comparative, publishing books that work across disciplinary perspectives, cross-culturally, or across different historical periods. The series is actively engaged in the analysis of the different theoretical traditions that have contributed to critiques of the `cultural turn'. We are particularly interested in perspectives that engage with Bourdieu, Foucauldian approaches to knowledge and cultural practices, Actor-network approaches, and with those that are associated with issues arising from Deleuze's work around complexity, affect or topology. The series is equally concerned to explore the new agendas emerging from current critiques of the cultural turn: those associated with the descriptive turn for example. Our commitment to interdisciplinarity thus aims at enriching theoretical and methodological discussion, building awareness of the common ground has emerged in the past decade, and thinking through what is at stake in those approaches that resist integration to a common analytical model.